If you need to lift a car or truck, then like everyone else, you’ve come to rely on BendPak. 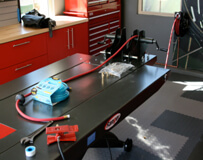 But if your true love is repairing and maintaining motorcycles and ATVs, then you deserve a specialty motorcycle lift. Ranger motorcycle lifting platforms are true ergonomic tools in every sense of the word. They are designed to reduce and eliminate worker fatigue by elevating motorcycles and ATV’s to comfortable working heights. Our proprietary pneumatic motorcycle lifts and air-over-hydraulic lifting systems have proven to be the top choice of industry professionals worldwide. If you demand the best from your tools and equipment, then demand Ranger. 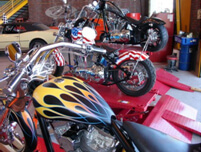 Our motorcycle lifts were designed by professional bike mechanics to help make Ranger motorcycle lifts the very best choice for any motorcycle or ATV enthusiast. Although there are many copycat motorcycle lifts on the market, no other that is built with the quality, care, and pride that has made BendPak / Ranger a global leader and a name synonymous with excellence. Ranger motorcycle lifts are easy to use and exceptionally durable. 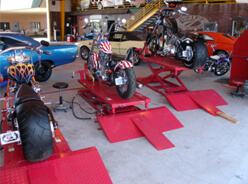 Our premium motorcycle lift platforms have many features not found anywhere else, and especially on lesser priced competitive models. By utilizing top quality components and advanced manufacturing techniques, Ranger motorcycle lifts can be expected to outlast competitive models that can only promise comparable quality. Ranger currently offers three motorcycle lifts to choose from, the sleek and dependable RML-600XL, the fully-loaded RML-750HD and the RML-1100 motorcycle jack. The Ranger RML-600XL Motorcycle Lift is constructed out of 12-gauge steel and covered with an attractive, durable powder-coat finish. Features include a drop-away rear wheel deck, extra-wide drive-up ramps, dual-screw front wheel vise and a pneumatic lifting cylinder that fully raises a bike or chopper in only 10 seconds. Optional side and table extensions are available. The Ranger RML-600XL Motorcycle Lift consistently delivers powerful capabilities ideal for servicing both ATVs and motorcycles, whether you're a professional mechanic or a dedicated bike-lover. The full-featured RML-The full-featured750HD Motorcycle Lift is our second motorcycle / ATV lift option for hobbyists and DIY'ers. With a 1,650-lb. lifting capacity and dual-functioning pump, you can raise your motorcycle or ATV your way, with either an air compressor or just your foot. Replete with automatic safety locks, retracting wheel deck, built-in retractable swivel casters, top-notch 12-gauge steel construction, durable powder-coating and a convenient 43” lifting height, the Ranger RML-750HD Motorcycle Lift is the best small-vehicle lifting solution on the market today. 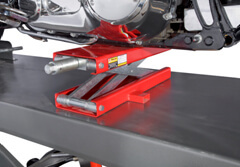 But if for any reason the ample raise height on either Ranger Motorcycle Lift just doesn't quite get it, we also have the RML-1100 Motorcycle / ATV Jack that works great with either lift or on the ground by itself. More and more people come to rely on Ranger motorcycle lifts than anyone else. Just like the stuff we sell, Ranger is up and running, always, with plenty of service, parts, and technical support. Whatever you need, whenever you need it, we’ve got your back. Nothing stops us from making sure you have the safest, most reliable and best performing lift equipment possible. Use the handy slider at the top of the page to browse and compare our full offering of Ranger Motorcycle / ATV Lifts and accessories, or click on another product section using the navigation bar to see something completely different.